Little girls love doing their hair, make-up and doing their nails. smitcollc.com has some fantastic playset for girls like this Nail Polish for Girls -Scented Polish with Emoji Stickers. The set comes with 3 scented nail polishes, 20 scented nail patches, 1 nail file and 1 sheet of nail stickers. Who best to ask if they like a product then a little girl right? Well, I just so happen to have my granddaughter who is 6 and she is my product reviewer for all toys in her age range. First thing Maiya did was to smell the polish to see if they were actually scented and they were. Her favorite is the purple which smelled like grape. Next, she spent at least an hour putting the nail patches on her fingernails and painting her toe nails and applying the nail stickers only to remove them and do it all over again! When I asked Maiya what did she think of the Nail Polish for Girls -Scented Polish with Emoji Stickers she replied, "I love it!" 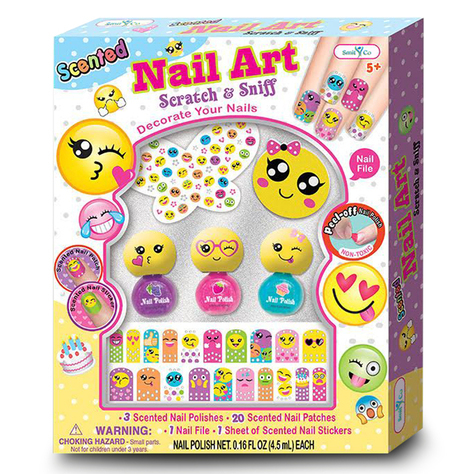 If your looking for a great gift check out SmitCoLLC not only do they have the Nail Polish for Girls -Scented Polish with Emoji Stickers but they also have many affordable gifts for girls ages 2-12!